An upgrade of the original TS-1000, the TSU2000 offers double the memory and new preprogrammed codes. 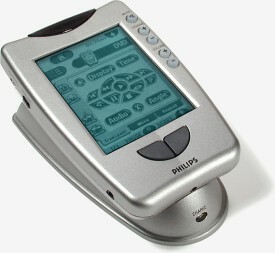 When the original Philips Pronto TS-1000 was released in October of 1998, it took the universal remote control market by storm. Despite the fact that it wasn't advertised for several months after its initial public unveiling, the Pronto took off with great gusto, beating Philips' sales projections. Why all this commotion over a mere remote control? Well, the Pronto was the very first graphical LCD touchscreen to hit the market. Mostly computer but designed solely for remote control tasks, the Pronto's technical specifications were advanced enough to make it a Truly Unique Product. Whatever your system, the Pronto claimed to be able to control it - and control it well. The Pronto's journey from concept to finished product was far from an easy one, meeting opposition that threatened to send it to an early grave. But it's to the designers credit that the product pushed on and did make it to market. Designed with a remarkably open-ended architecture, the Pronto completely ignored the traditional constraints of regular hard-buttoned remotes and instead wrote its own book of rules. Nearly unlimited macros with 255 steps each? Check. Learned signals on every device button? Check. Any number of devices, be it 1 or 50? Check. Custom labels? Check. An impressive list for sure, but it still wasn't enough to make the Pronto the kind of product to develop its own loyal user base. It's only when ProntoEdit, the Pronto's PC-based editing software package, was released a few months later that the Pronto genuinely captured the imaginations of multiple-remote-control-stressed consumers everywhere. ProntoEdit - a geek's best friend. "Unfriendly", "awkward" and "unintuitive" are all words that have been used to describe ProntoEdit - and rightly so. But other equally appropriate terms in use are "powerful", "advanced" and "limitless". By means of ProntoEdit, owners of the TS-1000 could create their own, truly custom interfaces. Star Trek, MS Windows, Monty Python, Disney - whatever whimsy dictated was possible. And so the Pronto captured the title of "most powerful remote control", away from earlier and more restricted hard-buttoned designs. So now, over two years later, how does the Pronto stand up? The product category that the Pronto helped create is now much busier than it was then, with many new and equally capable products available to suit a wide range of personal tastes. But the Pronto still manages to remain at the top of the heap in two important categories: customization and expandability. Philips, spurred by sales to improve their product, has recently released an update to the original TS-1000, the $399 USD MSRP TSU2000. The TSU2000 includes several valuable new features that just may help the remote keep its prestigious title for a while longer. Although the TSU2000 is very similar to the TS-1000, which Remote Central reviewed upon its initial release, we feel that enough time has gone by to warrant a re-look at the product. And so, this review will cover the entire capabilities spectrum of the TSU2000, from a stand-alone setup to full customization with ProntoEdit. Due to their nearly identical hardware and comparable feature set, most of the information contained in this review will also apply to the original Philips Pronto TS-1000, the Marantz RC5000 and the Marantz RC5000i (which will also be covered at the end). Some important differences do exist, which will be pointed out as the review progresses.